The diademed head of Queen Victoria with the legend “VICTORIA REGINA”. The standing, helmeted figure of Britannia holding a wreath in her outstretched right hand, over her left arm the Union Shield. Behind her is a lion and above her the word 'INDIA'. At the bottom of the medal are the dates '1857-1858'. Approx. 36 mm in diameter. Medal and bars in silver. Approx. 32 mm wide. White, red, white, red, white stripes of equal width. Ornamental and faintly horn-shaped and fixed to the disc by a claw and swivel of a longer type that is usually four on British medals. The Recipient’s initials and surname and his regiment or ship indented on the edge in Roman Capitals. 'DELHI' (30 May - 14 September 1857) awarded to the troops engaged in the re-capturing of the city. 'DEFENCE OF LUCKNOW' (29 June - 22 November 1857) awarded to the original defenders and the first relief force. 'RELIEF OF LUCKNOW' (November 1857) awarded to those engaged in the relief of the city. 'LUCKNOW' (November 1857 - March 1858) awarded to those engaged in the re-capturing of the city. 'CENTRAL INDIA' (January - June 1858) awarded to those present at certain other operations in various parts of Central India. 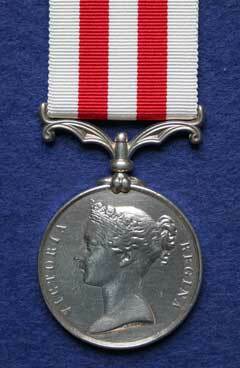 Authorised for award to all who were engaged against the mutineers by General Order No. 363 of 18th August 1858, but General Order No. 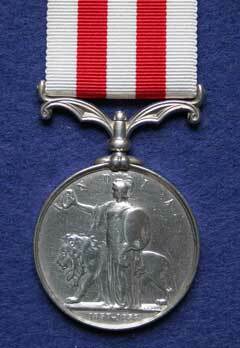 771 of 1868 (ten years later) extended the award to all who had been under fire or who had borne arms. The maximum number of bars awarded to any individual was four, but many medals were awarded without bars. The Mutiny was an attempt to overthrow the authority of the East India Company in 'British' India, which to a degree succeeded, as in August 1858 the Company's authority was transferred to the Crown. The Mutiny arose out of a long period of unrest in India which came to a head when the provinces of Oudh and the Punjab were annexed in 1856. Sepoys at Barrackpore mutinied in March 1857 because of rumours of Christianisation, and the use of cow or pig fat to grease cartridges, the ends of which had to be bitten off prior to use. But these were merely touch-stones to spark the fierce underlying feelings of the native population, both Hindu and Muslim. On 10th May 1857 at Meerut the first British soldier to be killed in the Mutiny was Colonel Finnis of the 11th Bengal Native Infantry, and his death was followed by those of all other Europeans in that city. The mutineers descended on Delhi and there they proclaimed the Great Mogul Emperor of India. Lucknow and Cawnpore were among the many cities and towns in which the European populations were besieged, and the final suppression of the Mutiny was only achieved in April 1859 after long and arduous campaigning by many thousands of British and loyal Indian troops. The Right Wing of the 1st Battalion was sent from Mauritius to India in September 1857 and did not serve in Central India where the Mutineers were most active. Companies were engaged with the Mutineers in the attack on the fort on the island of Beyt off the Gujerat coast on 2nd April 1858 when 23 casualties were suffered, and in the attack and capture of the village of Maudhata in the Mahi Kauta district in August 1858 where they suffered no casualties. The 208 officers and men of the Battalion who were present at either or both of these actions were awarded the Mutiny Medal without bar. One further medal was awarded as a result of the changed qualifications for the medal under the General Order No. 771 of 1868, the recipient, Private William Miller, having been engaged on Field Service under Captain Thomas Sheppard in 1858-59 in pursuit of rebel forces under Tantia Tope and Rao Sahib. This seems to indicate that others of the Battalion could possibly have been similarly entitled to the medal but were, for one reason or another, unaware of the new General Order.